The Zendesk Query component in Matillion ETL for Amazon Redshift provides high performance data load from popular Zendesk providers straight into Amazon Redshift. Easily load Zendesk data into Amazon Redshift tables, as standalone jobs or as part of sophisticated integration orchestrations. The Zendesk Query component in Matillion ETL for Amazon Redshift delivers fast data load performance and simple configuration, whilst being extensible to the most sophisticated data load and transform requirements. Simplified menu-based querying or activate Advanced Mode to unlock a powerful query engine for querying standard and custom objects using SQL. Specify distribution style (Key, Even or All) and Compound/Interleaved sort keys. Standalone data load or sophisticated integration – combine Zendesk data with data from other databases and systems e.g. Salesforce.com, Netsuite CRM, Microsoft Dynamics CRM, Google Adwords, Google Analytics, Facebook, Twitter and databases. Integrate with other AWS services including RDS, S3, DynamoDb, SQS and SNS. Monitor load status. Comprehensive logging, audit and alerting features. Selectively source data from common Zendesk categories such as Brands, Organizations, Tickets and Users. 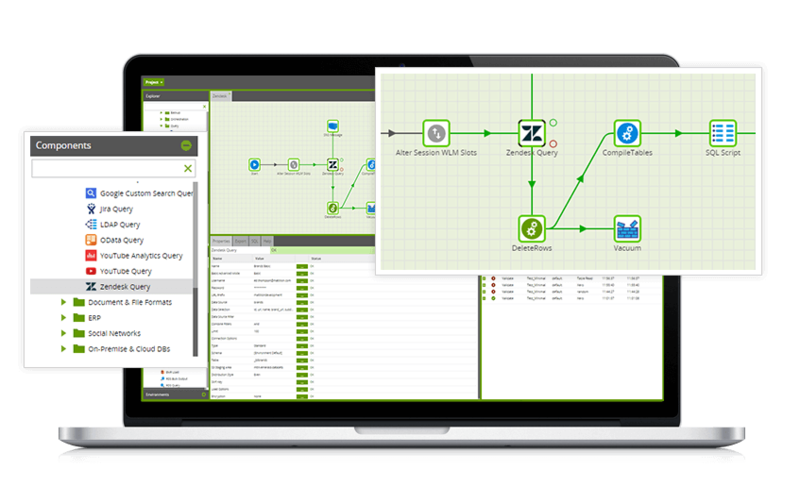 Want to try the Zendesk Query component in Matillion ETL for Amazon Redshift? Arrange a free 1-hour training session now, or start a free 14-day trial.